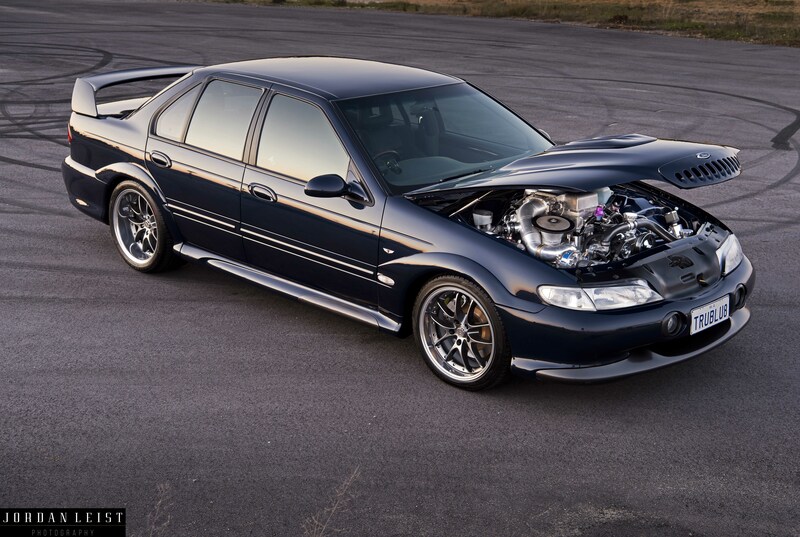 When Ford announced their decision to release the 30th Anniversary GT Falcon in 1997, many feared that it would be the last we would ever see of the Grand Touring icon. Dale Parker certainly thought so, but with only 272 GT’s being rolled off of the production line in Broadmeadows it was almost impossible to buy a brand new one. “I bought the car 15 years ago, and I searched high and low until a good secondhand one came up. After the purchase, I witnessed an XH ute with a Vortech T-trim supercharger on a dyno making some big power at a local workshop. I knew right away that was the direction I wanted to go with the GT. It was never going to stay standard for long,” laughed Dale. With instructions to piece together a bottom end that could comfortably support 700rwhp and still have plenty of room to develop, Sandro got to work. He started with a Dart Iron Eagle block, which was machined to accept a custom Callies Magnum crank, Lunati Pro billet I-Beam rods and RaceTec forged pistons to give a 357ci capacity. A set of Trickflow Twisted Wedge 205cc heads are bolted on to the block, with a Howard’s solid roller cam and lifters, Jesel roller rockers, and Manley valves taking care of the timing events. A custom Hogan’s Racing water-to-air intercooler and manifold is perched on top, with twin BBK 65mm throttle bodies feeding the motor the compressed air. A pair of 750 Pro Tuner fuel pumps send the E85 fuel up to a Hogan’s Racing fuel rail, outfitted with Bosch 2200cc injectors, while a crank trigger, LS1 coils and an Autronic SM4 ECU makes the whole deal run. Now Dale did have a T-trim supercharger from the earlier combo, but of course, he wanted to go bigger with that too, so a Vortech V-7 YSI was purchased and then modified with heavy-duty bearings so that it could handle more boost! Mike Crossing at Race On Custom’s completely the rest of the ali fab, bracketry and the intake pipework, while Leigh Fallon at Lethal Industries built a pair of headers that step from 1 ¾-inch to 1 ⅞-inch. While the motor was being pieced together, Dale turfed the original 4-speed BTR gearbox and had Paul from Keas Transmissions to build a Powerglide that was up to the task. Simon at Allfast Convertors supplied a 5,500rpm convertor, while Phil Purser from Final Drive built a 2-piece tailshaft as well as a 9-inch filled with 35-spline Moser axles, 3.9:1 gears and a Truetrac centre. The standard EL GT brakes were deemed sufficient for Dale’s intended use, but the rear suspension copped some tweaking in the form of Viking coil overs and McDonald Bro’s adjustable trailing arms. The interior remains mostly standard-issue EL GT, other than the addition of a B&M Stealth Magnum Grip Pro Shifter, and Autometer fuel, oil, boost and shift light gauges so that Dale can keep a keen eye on things. In the interest of safety Mike Crossing also fabricated a 5-point roll cage that follows the roof line so neatly that you almost don’t notice it until you open the doors. Also not immediately noticeable is the FG bonnet bulge that Sam Rhodes from Vulcan Panel and Paint has grafted into the bonnet or the subtle smoothing that he has done in the engine bay to make it look symmetrical. To finish off the exterior, ROH Adrenalin 18×8.5’s and 18×11’s got the nod. With the GT now all buttoned up and ready to roll, it was time to hit the dyno and get a tune in it. That happened earlier this year, where Dale had it run up on the SCM chassis dyno where Lane Heenan from Race Torque tuned it to the sound of 895rwhp @ 23psi!